Terrorists used tube artillery in the area of Novohryhorivka. Over the past day, the Russia-backed Donbas militants waged 28 fire attacks at the positions of the antiterrorist operation (ATO) troops in Donbass, the press center of the ATO reported 25 November on Facebook. The terrorists employed artillery in the area of Novohryhorivka. 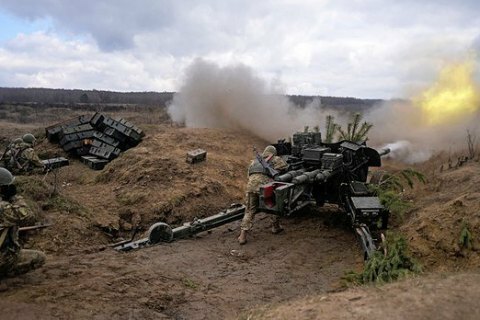 In the Mariupol sector, the militants fired mortars of various calibers in the areas of Mariyinka, Krasnohorivka, Novotroyitske, Shyrokyne, Hnutove, Slavne and Vodyane. Near Starohnativka they used infantry fighting vehicle weapons. In the Luhansk sector, the ATO positions near Novozvanivka, Krymske and Novooleksandrivka came under mortar and rocket-propelled grenade fire. Small arms were fired at the ATO positions in the villages of Novooleksandrivka, Stanytsya Luhanska and Krymske. In the Donetsk sector, the militants fired grenade launchers of various systems at Avdiyivka. An enemy sniper was active in the area of Opytne. On 23 November, one Ukrainian soldier was killed in Donbas, no injured was reported.